Milan is the latest city to join the ranks of Paris, Madrid, Brussels, and Dublin in expelling cars from its smoggy, often gridlocked city center. Unlike its more zealous counterparts, the city has opted for an incremental approach, with no proposed timeline and a gradual, virtually street by street implementation. Despite taking things slow, deputy mayor Lucia di Cesaris stressed that the plan will amount to no less than a “soft revolution.” Earlier this month, she announced the pedestrianization of the Piazza della Scala, the grand square on which the Scala Opera House is located. 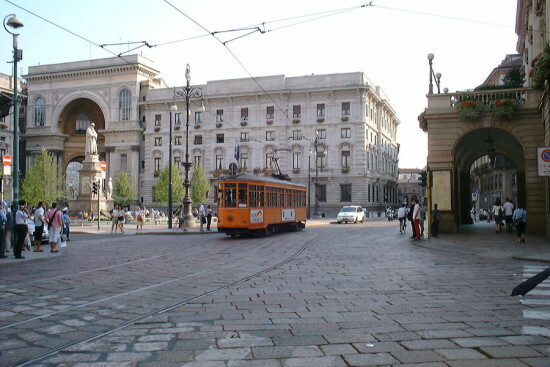 Purging the square of vehicles will extend to the north the existing pedestrian zone in Milan’s heart, consisting of the Cathedral Square and the area around the Galleria Vittorio Emanuele II, the adjacent shopping arcade. After the Piazza della Scala joins up with this zone, the car-free area will extend into the streets beyond the square. Pedestrianization of this area, a hub for arts and culture venues, is a welcome move to transform it into a thriving, open-air promenade. Over on the city center’s southern edge, Navigli, one of Milan’s most romantic neighborhoods, is expanding its pedestrian area, creating a car-free bar and café quarter to add to the just-pedestrianized Piazza Missori nearby. Ultimately, the objective is what the deputy mayor calls “the creation of a vast area of pedestrian privilege.” Long beset by pollution problems, Milan has experimented with an array of schemes—from banning traffic altogether for 10 hours on a Sunday in February 2004 when smog levels exceeded the statutory maximum, to paying commuters to leave their cars at home and use public transportation. A coalition of Milanese companies sends drivers vouchers worth $1.87 (the average daily cost for using public transportation) for each day their vehicles stay in their driveways between the hours of 7:30am and 7:30pm. Dedicated “black boxes” installed behind vehicle dashboards track the car’s whereabouts to verify compliance. According to Inrix, a traffic information provider, Milan has the worst traffic of any city in Europe, and one of the highest pollution levels in the continent. Microbe Road. 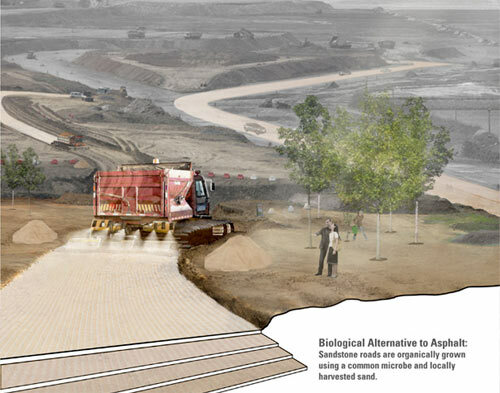 Designers Thomas Kosbau & Andrew Wetzler have proposed scrapping asphalt in favor of a more eco-friendly sandstone paving surface created with locally harvested sand and cemented together by a common microbe. Yanko Design points out that the Incheon International Design Awards entry would save oil and help relieve the urban heat island effect. Super-circle XLVI. While the buzz surrounding this year's Superbowl has yet to subside, Indianapolis has focused its eyes to next year's big game. Urban Indy reports that the city's iconic Monument Circle will be pedestrianized during the week-long festivities, which could bode well for future car-free endeavors. ARC Resurrected. New Jersey Governor Chris Christie may have derailed the proposed ARC train tunnel connecting Manhattan and NJ last year, but a new plan floated by Amtrak could provide a new tunnel opportunity. The Transport Politic has details on the so-called Gateway Project. Ben van Bistro. Just in time for spring, the New Amsterdam Pavilion designed by UN Studio principal Ben van Berkel in Manhattan's Battery Park will offer eco-friendly food, craft beer, and organic wine. DNAinfo says the pinwheel-shaped restaurant will be called Battery Bistro. Before closing Broadway got her branded a car-hating communist, DOT commissioner Janette Sadik-Khan was already well on her way to transforming the city's streets. One of the most memorable events--and a sign of things to come--was last year's Summer Streets program, which, for three Saturdays last August, closed off a large swath of Manhattan from the Brooklyn Bridge to 72nd Street, with most of the course running up Park Avenue. (There was also a less publicized closure of Bedford Avenue in Williamsburg.) 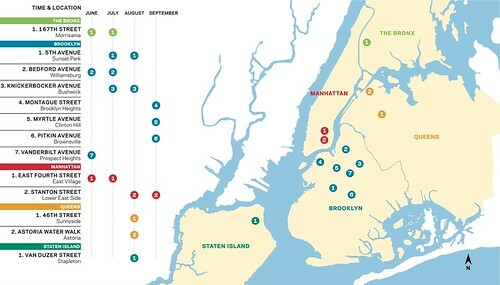 Never one to stand (or bike) still, Sadik-Khan and the mayor announced today the expansion of the program throughout the summer and across all five boroughs this year. Details after the jump, but first two quick thoughts: Brooklyn, with seven sites, is the obvious winner; and why no Park Avenue this year? * Bronx Summer Walks – 167th Street between Gerard and Cromwell Avenues, Saturday June 20th, 27th and July 11th, 12 p.m.- 4 p.m., Sponsored by Local Development Corporation of the Bronx. * Williamsburg Walks – Bedford Avenue between North 4th and North 9th Streets, Saturday June 6th, 13th, 20th, and 27th and July 4th and 11th, 12 p.m.- 9 p.m., Sponsored by Neighbors Allied for Good Growth, L Magazine. * Summer Streets on Vanderbilt – Vanderbilt Avenue between Dean Street and Park Place, Sundays in June, 12 p.m.- 5 p.m., Sponsored by Prospect Heights Neighborhood Development Coalition. * Summer Plazas, 5th Avenue – 5th Avenue between 48th and 52nd Streets, Sunday July 19th, 26th and August 2nd, 11 a.m.- 6 p.m., Sponsored by Sunset Park BID. * The Sunday Scene on Knickerbocker – Knickerbocker Avenue between Suydam and Starr Streets, Sunday July 19th, 26th and August 2nd, 11 a.m.- 5 p.m., Sponsored by Ridgewood Bushwick Senior Citizens Council. * Pitkin Saturday Plazas – Pitkin Avenue between Strauss and Thomas Boyland Streets, Saturday September 12th, 19th, and 26th, 11 a.m.- 5 p.m., Sponsored by Pitkin Avenue BID. * Move About Myrtle – Myrtle Avenue between Clinton Street and Emerson Place, Sunday September 6th, 13th, 20th, and 27th, 11 a.m.- 7 p.m., Sponsored by Myrtle Ave Partnership. * Montague Summer Space – Montague Street between Hicks and Clinton Streets, Sunday September 13th, 20th, and 27th, 10 a.m.- 6 p.m., Sponsored by Montague BID. * Meet the Street – East 4th Street between Bowery and 2nd Avenue, Saturdays in June, 3 p.m.-8 p.m., Sponsored by Fourth Arts Block. * Stanton Street Summer Sundays – Stanton Street between Allen and Orchard Streets, Sunday August 23rd and 30th and September 6th and 13th, 1 p.m.- 6:30 p.m., Sponsored by Lower East Side BID. * 46th Street Weekend Walks – 46th Street between Queens Boulevard and Greenpoint Avenue, Saturdays in August, 11 a.m.- 8 p.m., Sponsored by Sunnyside Shines BID. * Astoria Water Walk – Shore Boulevard between Astoria Park South and Ditmars Boulevard, Sunday August 9th, 16th, and 23rd, 11 a.m.- 4 p.m., Sponsored by Astoria Park Alliance. * Van Duzer Days – Van Duzer Street between Wright and Beach Streets, Saturday August 1st, 8th, 15th, and 22nd, 12 p.m.- 8 p.m., Sponsored by Downtown SI Council.